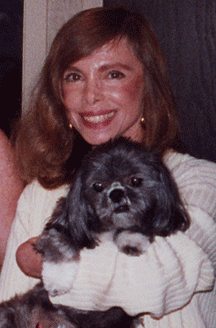 When her beloved pet, Pudding, was diagnosed with kidney disease in 1999, Andrea Miller Holzheimer became an expert on doggie nutrition and began baking homemade, all natural dog biscuits for her pooch. But these were not your every day garden-variety dog treats. Andrea's approach to baking them was her love of dogs, her appreciation of sun-grown fresh ingredients, and her determination to keep Pudding with her as long as possible. So she painstakingly twice-grated the carrots, used only freshly ground peanuts, and meticulously shaped each bone into a heart, elevating her biscuits in to the realm of culinary art. Andrea soon realized that other pet owners were interested in the preservative-free gourmet bones, and she began selling the pooch treats through local retailers, in addition to donating her treats to local dog shelters. Sadly, when Pudding passed in 2011, Andrea made a vow. "I promised I would make her famous." Sun of a biscuit luxury dog treats are a promise delivered and, yes, that's Pudding's face on the box. Together, Andrea and Pudding are promoting the wellness of dogs nationwide through their healthy treats, educating consumers on the importance of a fresh, natural diet for their pets, and engaging with animal rights groups. Andrea also keeps every phase of her business in America, from sourcing to distributing a portion of her profits to help animals in need. Andrea has expanded to a professional bakery that manufactures her treats. Small batch baking continues to guarantee unparalleled quality, purity, and freshness. Welcome to Sun of a Biscuit!